The pork shortage hysteria hitting the United States and Britain has been labled unavoidable by Britain’s National Pig Association. The global failure of maize and soy harvests caused pig farmers to be plunged into loss by high pig-feed costs, according to a press release. New reports that describe the potential bacon shortage as the “aporkalypse” may be a bit hyperbolic, but bacon lovers as well as economists are not convinced. The loss of profit among hog farmers has caused stress in the world of pork, so much so that there is a slight chance that there will be a bacon shortage in 2013. Feed soared to an all-time high in August due to a drought throughout the Mid-west. The drought caused the cost of feed to rise to as much as $175 for a 200-pound hog. In the past, the price of a pig has been roughly $120 to $150 per 200-pound hog. This has resulted in a loss of up to $50 per porker. A U.S. livestock industry economist said it is not yet time for U.S. consumers to start hoarding pork or bacon just yet. 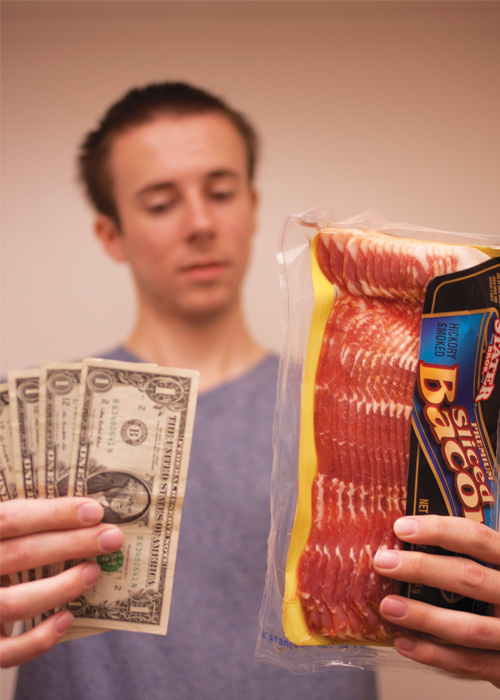 Since the supply is still in high demand but stock is steadily shrinking, economists have an efficient mechanism for dealing with this shock – when the supply of bacon decreases, the price increases. This could incite full-blown panic about bacon. “I would probably start looking for a second job to fund my bacon addiction. If that didn’t work out, I might give priority to garlic, my second favorite food,” said David Tibbitts, senior communications and political science double major. The popularity of bacon is prevalent among 18- to 24-year-olds, which is demonstrated by the “I Love Bacon” Facebook page that currently holds more than 16,000 likes or the “Bacon is Yummly” page that has over 339,000 likes. The love of this savory treat is close to the hearts of many college-aged students on campus, so much so that students are not ready to give up bacon. With agricultural grains or even manufactured products, prices can fluctuate to changes in supply and demand easily. “My morning routine consists of making bacon, and if there was an extra-ordinarily high increase in the price of bacon, I would have to come up with something else to eat,” said Beth-Jayne LaCuesta, senior psychology and sociology double major. Because of the drought and the rising prices of feed, pig herds have been shrinking all across Europe over the past year. The BNPA said declining herds have caused slaughtering rates to drop by just 2 percent, causing prices to be increased roughly 10 percent within the next year. “I have been a fan of pork for a number of years, (and if there was a shortage), I would miss my weekly dosage of carnitas platter from my favorite Mexican food spot,” said Chris Jamison, senior communication studies major. The drastic effects on international bacon supply occurring throughout Europe has caused the U.S. to scramble to save the pork industry. The U.S. government has created a pork-buying program to ensure pig farmers do not go under. “If there is a bacon shortage, we will do our best to accommodate by providing different recipes and alternatives for bacon, such as turkey bacon,” said Eric Dacosta, Provider’s manager. However, students are not letting the impending shortage stop them from enjoying their favorite food. “If the pigs are going to be gone, they will be gone. I am definitely going to enjoy bacon,” said Cesia Brown, junior nursing major. Time predicts that consumers are not likely to notice the drastic effects until six months from now. It is not time to start hoarding yet. APORKalypse, bacon, britain, CBU, Pigs, Pork, U.S.
National Hockey League lockout: Helping or hurting?